Streamline and automate your business processes and save yourself time and money by having an employee time off request system integrated with your employee time clock software. Create time punches for approved requests in just seconds. We had a labor audit a few years back. The state requested our time sheet reports of our employees. They asked for weekly, monthly and yearly reports of different employees and it was not a problem to supply them with whatever they wanted using Time Clock MTS. Could not dream of using anything else. 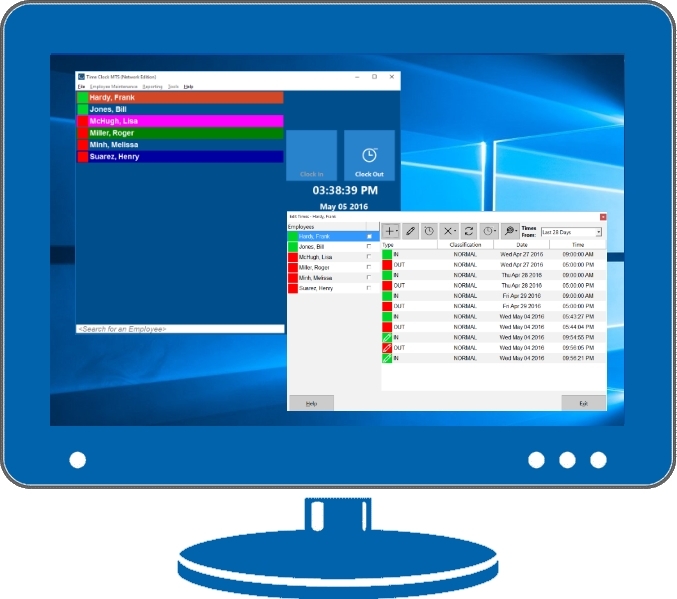 Time Clock MTS allows you to automate your employee time clock data collection and provides an integrated employee time off request system. Get rid of paperwork and needless overheads by streamlining and integrating your business processes. 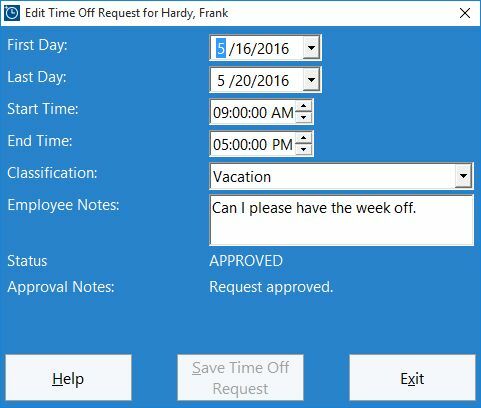 You can eliminate time spent handling manual employee time off requests, getting approval for requests, and recording the time off in your payroll systems. Time Clock MTS wraps all of these into one neat package that will save your business time AND money. • No more forgotten or lost time off requests. Time Clock MTS will help you to reduce errors in your payroll when dealing with time off requests. Time Clock MTS can be tried for free for 30 days without obligation or charge. And we don’t want your email address or credit card either. Just download Time Clock MTS and install it and start collecting your employee time clock information right now. Best of all there’s no limit to the number of times your employees can clock in or out during the trial period, nor is there any restriction on using the other useful features that Time Clock MTS offers to help your business save time and money. You could further streamline your business with integrated Employee Tip Tracking, track your job costs better with Job Tracking, and help to eliminate payroll fraud with Biometric Security. The easy to use fingerprint timeclock software with a fully functional 30 day trial.